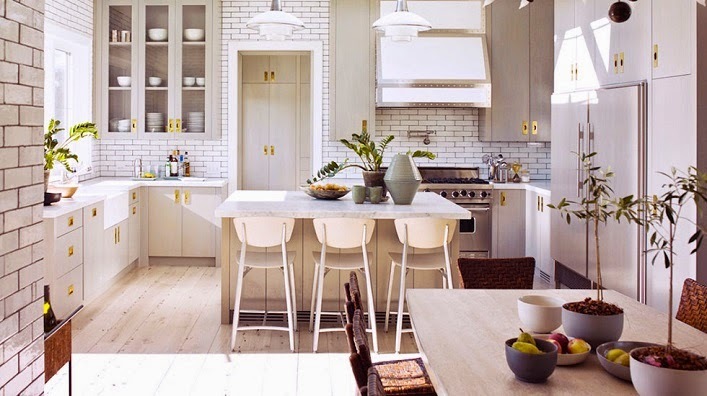 This beautiful New York beach house kitchen is designed by the talented Steven Gambrel. Conjuring a sense of lightness and casualness, this kitchen emits style and easy living, perfect for a beach house. I like how the designer takes the subway tiles from floor to ceiling to make a huge visual impact. I also like the stunning gold hardware and the sleek range hood details. The abundance of natural light, tall ceilings and roomy size is a major plus for this enviable kitchen. A dream kitchen and inspirational space for sure! What are your thoughts? Are you in love with this fabulous kitchen as much as I do? I love his work...he is the nicest man..I had the privilege to meet him at the Santa Barbra design house. Oh, yes, that works for me too!